Coach has launched Poppy Wild Flower, a new flanker to 2010′s Coach Poppy. Other Poppy flankers include Poppy Flower, Poppy Blossom, Poppy Citrine Blossom and Poppy Freesia Blossom. With delicate notes of orange flower and muguet, and a hint of musk at its base, new limited edition Poppy Wildflower is an intriguingly beautiful scent that captures the essence of a hidden city garden. Exotic patchouli, iris and vanilla give it an unexpected edge. 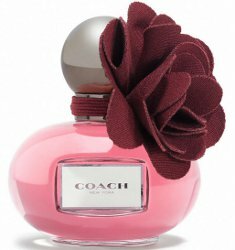 Coach Poppy Wild Flower is available in 50 ml Eau de Parfum, $65. If I’m not mistaken, I saw this in Ulta today. I didn’t even bother to sniff any of the Coach fragrances because I was too busy checking out the Chanel line. I have to go back tomorrow and will check it out. I love the bottle and the flower was a nice addition. Hope it smells as good as it looks.